This section includes tune books, CDs, DVDs, and videos for Contra musicians, dance instructors and budding callers. 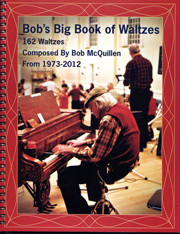 All 162 of Bob's magic waltzes are alphabetically listed and beautifully presented in this NEW 80 page spiral bound book. His waltzes are all dedicated someone, and they provide a history of the last 40 years of contra. Bob McQuillen is a legend in the Monadnock region of New Hampshsire and beyond, and is an inspiration for the thriving Contra dance and traditional music community in the area. He has written over 1,300 tunes and is still at it. They are published in fourteen tune books, "Bob's Note Books". An index for all of Bob's Note Books is available. Bob usually dedicates a tune to somebody, and he tells you why. Great Meadow Music is proud to be the publisher for Bob's tune. Note Book volumes 1 and 2 are combined in Note Book 1/2. 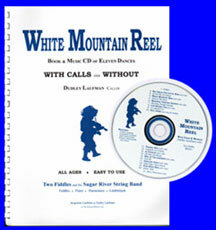 Full Swing is a CD with eight "dance length" cuts, plus a twenty-four page instruction booklet for callers and dancers. Susan is a first class dance caller and teacher and writes about the culture and music of Contra dance in the booklet, as well as the basic dance skills. If you are a budding caller or a new dancer, or you just want to hear exciting New England Contra music, this CD is for you! The booklet is now available separately. 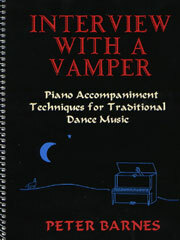 This book teaches piano accompaniment for Contra dancing. Peter starts with "For the Total Beginner" and progresses through "the works." Some of the items covered are: Bass Runs and Rhythmic Effects, Chording Phrasing, Left Handed Maneuvers, Chord Substitutions. Peter states, "And don't ever hesitate, if you see me at a dance, to come up and ask me about anything that I'm doing or that you yourself are working on." 138 pages. These spiral bound tune books are a necessity for English country dance musicians. The fact that they have been reprinted so many times has to say something about them. Published in 1992 and reprinted four times, this tune book contains 400 waltzes, polkas, tangos, hambos, zwiefachers and other traditional dance tunes. It is an essential resouce for couple dance musicians. The 60 Minute Chimes of Dunkirk video (VHS or DVD) includes 17 of the dances from the Chimes collection and is filled with tips and techniques on teaching traditional dance to children. It can be used alone, or as a companion to the Chimes of Dunkirk book and CD. Listen to the Mockingbird is a successor to New England Dancing Masters' earlier collection, Chimes of Dunkirk and is designed for dance instruction with children, schools, and communities. It includes detailed instructions for teaching numerous dances, as well as tunes. The accompanying CD includes dance length recordings of music for all the dances in the book, played by some of New England's finest dance musicians. The book and CD can be used alone or in conjunction with Chimes of Dunkirk. For more New England Dancing Masters products click here for their website. The New England Fiddler's Repertoire, now in its 6th edition since 1983, is the "bible of New England fiddling," considered by many to be the indispensable music book for traditional musicians. It contain's one hundred and sixty eight of New England's best known and loved fiddle tunes for any melody instruments such as fiddle, flute, piano, whistle and accordion. The CD, New England Chestnuts contains 19 tunes from New England Fiddler's Repertoire. Fiddler's Throne contains 375 jigs, reels, hornpipes, marches and waltzes. The collection is based on Randy's collecting trips in Britain America. One fifth of the tunes are recently composed by musicians such as Liz Carrol, Jerry Holland, Randal Bays, Randy Miller, and the late Ralph Page, Dean of New England Contra, are included in this collection. Also included are 18 tunes from the manuscript of New England fiddler Johyn Taggart (1895-1943). Arrangements and chord suggestions are by Randy, based on 30 years' experience as a Contra dancer, a fiddler and a piano player. Randy has organized this book to a fare-the-well - 256 pages, chords included, tunes alphabetically, indexed by tune types, composers and more! become staples for contra musicians across the country. Each volume has about 300 tunes arranged alphabetically. There is comment on each tune in the back of each book. A companion CD to Volume 1 is described in the Contra Roots and Branches section, Companion CD and the companion CD to Volume 2 is described below. This CD gives you an opportunity to play along with Susan Songer and Friends on 97 selections from The Portland Collection tune books, volumes 1 and 2. Susan's liner notes are helpful. The tunes are listed by both key and meter. Ralph Sweet is a contra/square dance legend and Nils Fredland is fast becoming one. This 226 page spiral bound book captures Ralph's favorite ninety squares from over the last 60 years. 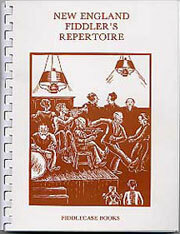 The book includes instruction on singing squares and patter calling. Music for singing squares is included. This book will be a bible for square dance callers. "I can hardly believe that a full seven years have gone by since the publication of the last Waltz Book, and ten years since the first book came out. Based on the volume of phone calls, letters and emails I recieve each week, the interest in this wonderful genre is, if anything increasing. The reasons why aren't hard to fathom. First of all, the tunes are varied and pretty and they're fun to play, and to listen to. Second, waltzes are especially acceptible. This makes them fun for beginning players." All three books are spiral bound and the tunes are listed alphabetically in each. 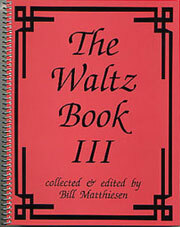 Each book contains about 60 waltzes. Here is a collection of 73 reels, jigs, waltzes and other dance tunes written by musicians of the Connecticut River Valley. Many of these tunes have become standards in New England. The tune "The Gale" alone is worth $15. !! This spiral bound tune book offers 29 melodies and their chords from the Tidal Wave CD, with bilingual comments.